President Barack Obama makes bologna sandwiches alongside Dolly Garcia, a federal employee from the U.S. Census Bureau, at Martha’s Table in Washington, D.C., Oct. 14, 2013. On any given day, 49 percent of U.S. adults will eat a sandwich. Something so ubiquitous surely deserves some closer attention. Using the same data that Wilkinson Enns and her colleagues used, I set about researching what Atkins-averse Americans are putting in their sandwiches. The data comes from the National Health and Nutrition Examination Survey conducted by the Centers for Disease Control and Prevention. It’s based on interviews with more than 5,000 adults age 20 and older who were asked about absolutely everything they ate on two separate days — and the data is so vast it’s served in two slices. Although the information was collected in 2009-10, it’s the latest we have, and what it lacks in recency it more than makes up for in detail. I can search for every ingredient that was used in any sandwich eaten by the survey participants. And I did. Lowly lettuce tops the list (it also rates as America’s fifth-most frequently consumed item overall, after water, milk, coffee and sugar — and just ahead of “soft drink, cola type”). Ham is the most common sandwich meat, followed by chicken or turkey loaf and then beef. 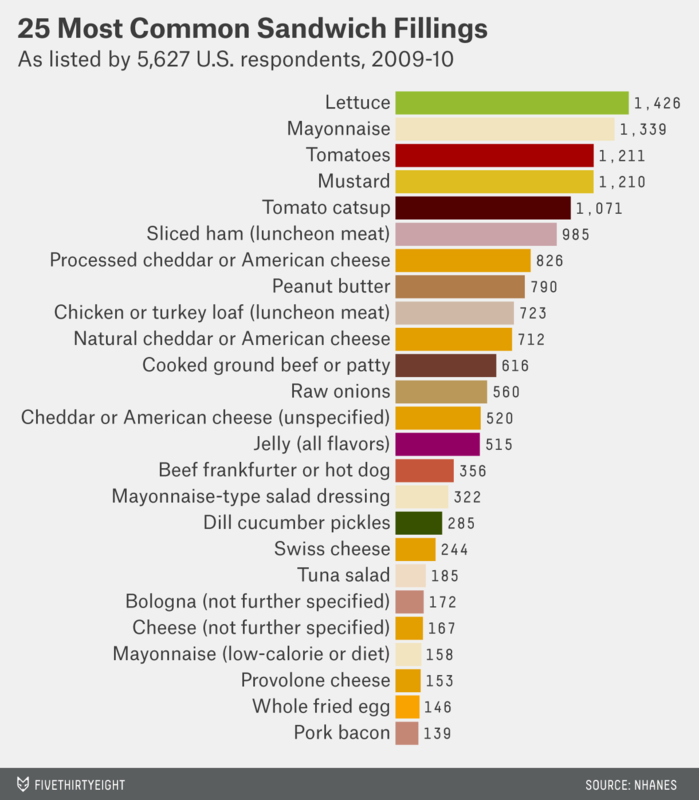 And if you’ve ever wondered which sandwich sauce wins, this data offers an answer: Mayonnaise beats mustard, which beats a condiment the CDC calls “tomato catsup,” aka ketchup. Peanut butter features in 790 sandwiches, and yet jelly lags behind at 515 sandwiches, suggesting that the combination isn’t a sure thing. The healthier option, “jam, preserves, all flavors” appears far lower on the list, used as an ingredient in just 100 sandwiches and “hummus” only made it between slices on 12 occasions. But so far, I’ve only looked at what’s inside — unsurprisingly, breads dominate the list of sandwich ingredients. 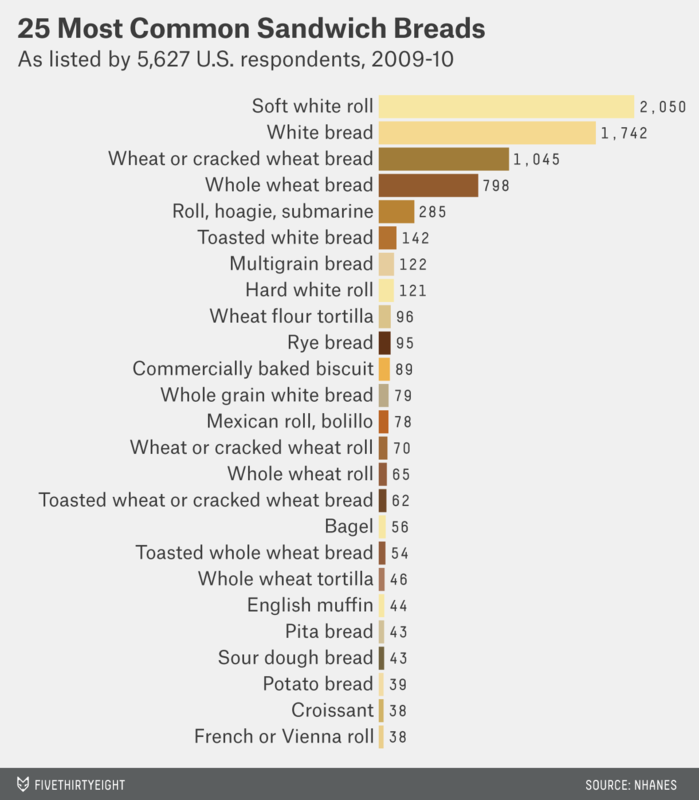 So here’s the last tranche of the story, showing that bagels and pita bread still lose (by a mile) to the soft, white roll. If you’re curious about who’s eating these sandwiches, there are clues in the data. One row tells me that on Day 1 at 2 p.m., respondent 51807 ate meat loaf made with beef, which he described as an almuerzo he ate at home. But you can also find out a lot more about respondent 51807, who, it turns out, is a 79-year-old male who served in the U.S. armed forces and was born in a Spanish-speaking country (but not Mexico). He is widowed and refused to answer the interviewer when asked how much his household earns and how long he has been in the United States. All of a sudden, that “almuerzo” (lunch in Spanish) makes sense and the numbers seem a lot less abstract.